Small SUV sales are booming while less people are buying passenger cars, but which is the better vehicle? TO SUV or not to SUV? That's the question facing an increasing number of car buyers. 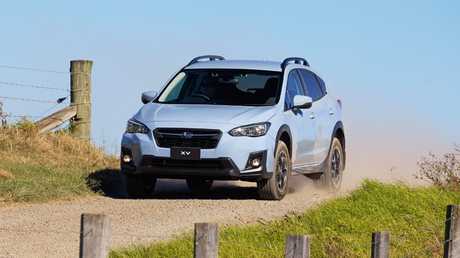 Last year was the first time high-riding hatchbacks, faux-wheel-drives and genuine off-roaders - all grouped under the SUV label - overtook passenger car sales in Australia. There are no signs of the trend slowing. Are we being taken for a ride? SUVs come with a price premium - even though they're not necessarily dearer to manufacture - and often are smaller than their hatchback equivalents. To size them up we got reacquainted with the top two sellers combined: the Mazda3 and CX-3. Together, this pair narrowly outsells the Toyota Corolla and C-HR. To date there has been little cannibalisation of small car sales in favour of small SUVs. So far this year small cars have dipped by 4 per cent while deliveries of small SUVs have jumped by 25 per cent. No wonder car companies are laughing all the way to the bank. Mazda CX-3 has a noticeably narrower cabin. 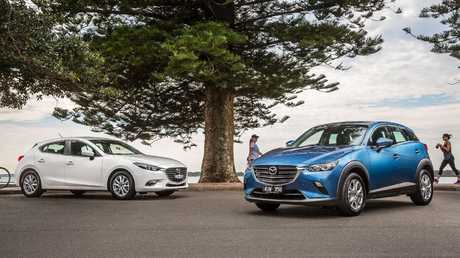 As with rivals, the Mazda pair has a price gap, but it's the slimmest margin in the business. At $27,490 drive-away, the CX-3 Maxx Sport front-drive automatic is just $2000 more than its equivalent in the Mazda3 range. 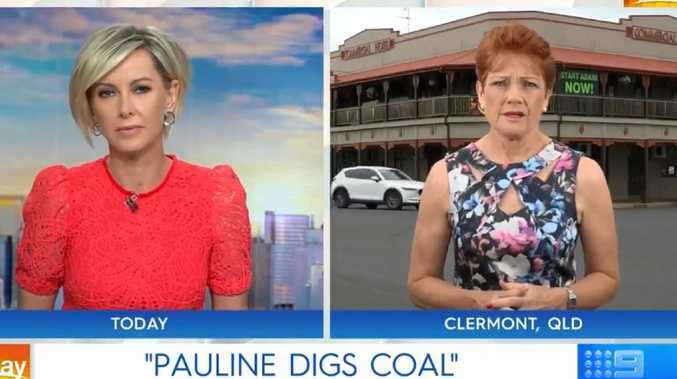 For most other brands the price hike ranges from $3000 to an astonishing $7000. However, there is a good reason for the Mazda's modest price premium: it's actually based on the cheaper and much smaller Mazda2 - even the dashboard is the same, albeit with a strip of soft-touch trim. The CX-3 is a stunning piece of design but it doesn't take long to measure up some of its shortcomings. Compared to the Mazda3, the CX-3 cabin is noticeably narrower, the cargo area is smaller and the knees of adult rear passengers touch the seat in front. 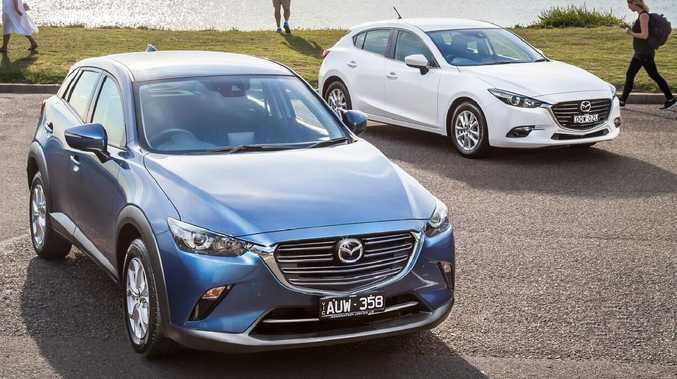 The perception is backed up by the figures in the brochure: the Mazda3 is roomier in all key dimensions than its dearer and smaller CX-3 sibling. A recent update has brought worthwhile and noticeable improvements in the way the CX-3 drives. The Mazda3 and CX-3 have are the closest in price of any of the hatch/SUV pairings. 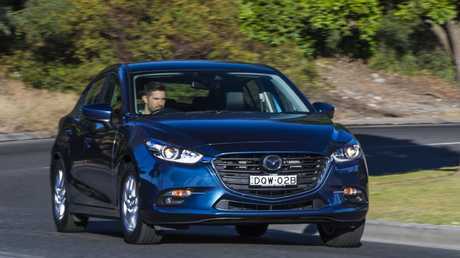 Powered by a 2.0-litre engine and paired to a conventional six-speed auto, it's the perkiest among its peers, even with slightly less power than the Mazda3's 2.0. Other small points of difference: the Mazda3 has paddle-shifters on the steering wheel, and dual-zone airconditioning. 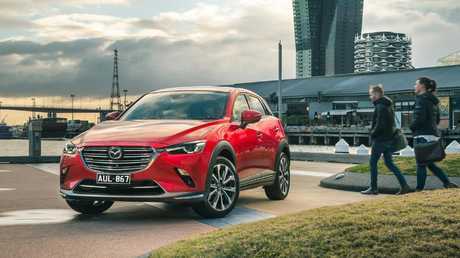 Despite the recent update the CX-3 still lacks the excellent road-holding of the Mazda3, which is both supple and grippy whether on bumpy back roads or negotiating suburban roundabouts. The Mazda3's larger footprint helps it feel more natural to drive and more comfortable over bumps than the CX-3, which can take a while to recover from rough patches. A surprising outcome from the test, the Mazda3 used a fraction less fuel than the CX-3; the fuel economy label figures also show the CX-3 is a touch thirstier. The CX-3 does have some advantages. It has a slightly taller view of the road ahead and is available with the option all-wheel-drive in a class where most rivals don't give buyers a choice. The Mazda3 is nicer to driver benefiting from a larger footprint. What this exercise shows most of all, however, is that car-buying is not always a rational decision. Hatchbacks previously regarded as sensible are now viewed as shopping trolleys. Today's buyers crave a car with outdoorsy styling that appeals to our sense of adventure - even when stuck in traffic with everyone else. As long as hearts overrule minds, sales of SUVs will continue to rise. 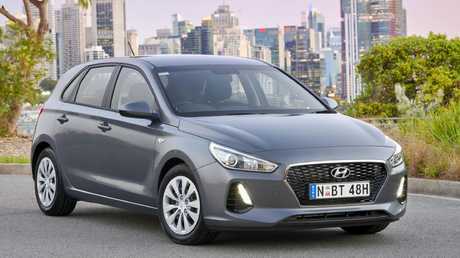 The Hyundai i30 Go has the same size engine as the Kona, but it produces more power. 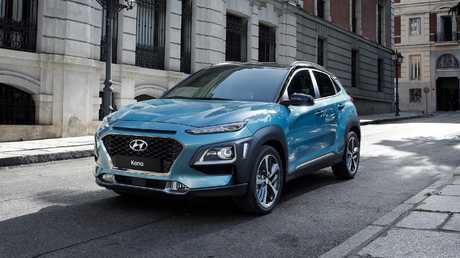 The i30 Go automatic starts at $22,990 drive-away but its SUV equivalent, the Kona Go automatic, is $25,990 drive-away. They share underpinnings, so the driving experience is similar. The engines are the same size but the i30 has the power advantage. The $3000 premium for the Kona also buys a car with less interior space, a smaller boot, and a space-saver spare. The Kona comes with a space-saver spare. Even with a full-size spare, the i30's boot is bigger because Hyundai designers wanted the Kona to fit in a slightly smaller parking space. As with the Mazda, the Kona is one of the few small SUVs that can be optioned with all-wheel drive. 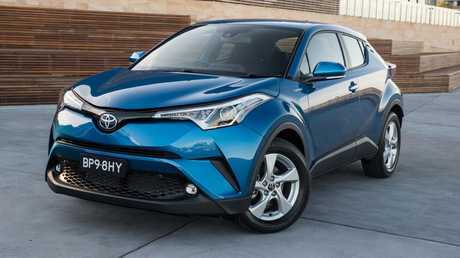 The Toyota C-HR is $3000 more expensive than the Corolla. The Corolla Ascent Sport automatic starts at $27,990 drive-away but its SUV equivalent, the base C-HR, is $30,990 drive-away for a front-drive automatic. Each uses Toyota's new-generation underpinnings and so has the same footprint. With their unique body designs, there are significant differences in how interior space is used. This is one instance where the SUV might make sense. In the new Corolla hatch, the rear seat space is a squeeze and the boot, though tiny, still houses a full-size spare. The new Corolla has a tiny boot, but it still holds full-size spare tyre. The C-HR, designed for weekend getaways to far flung places requires hard-to-get premium unleaded and has a space-saver spare. 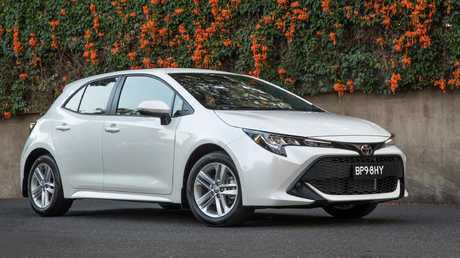 Its 1.2-litre turbo is comparatively asthmatic, with less power than the Corolla's 2.0-litre. As with the Mazda and Hyundai, the C-HR can be optioned with all-wheel drive. Eclipsing both on space and capability, the stablemate RAV4 is now in runout at just $1000 more than the base C-HR at $31,990 drive-away. The Subaru XV comes at a massive price premium when compared to the Impreza hatch. 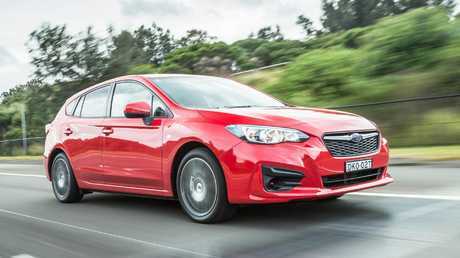 The Impreza 2.0i hatch is $25,490 drive-away and its SUV equivalent, the XV, is a whopping $7000 more at $32,490 drive-away. Are you sitting down? They're the same car - the XV is an Impreza with hiking boots. It has taller suspension, unique bumpers and some body cladding to make it look like an SUV. Standard equipment, engine and transmission are the same. Both are constant all-wheel drive, with the XV's unique driving mode giving better grip in slippery conditions. The XV's boot is smaller because there is a full-size spare under the floor and fuel economy is slightly higher due to the all-terrain tyres. The Impreza hugs the road better thanks to its low-profile tyres and its AWD is all you need to get to the snow without needing to fit chains. But it doesn't have the XV's looks and that matters to a lot of people. We've even fielded queries from buyers who ruled out the Impreza in favour of the XV because they thought it was a smaller car. Now you know why car designers get paid big bucks. READER QUESTION: Which $15k used 7-seat SUV should I buy? What’s a good used wagon for towing our medium-size caravan?